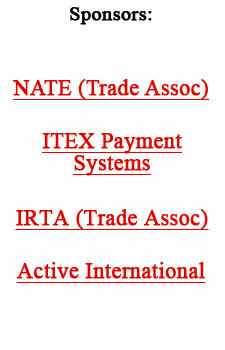 Now into its 27th year of existence, IRTA?s board of directors has addressed the issue and acknowledged that there should be a way for exchange systems that are not commercial barter exchanges to become members...and thus created a non-commercial category for IRTA membership. At the same time a new effort to protect the IRTA brand is in the works. Each member will receive a certificate for office display and also a digital ?IRTA 2006 Member? logo to place on their web site. The logo will be uniquely verifiable when a computer mouse is placed over it, so it cannot be duplicated. Executive Director Krista Vardabash explained, ?An IRTA membership is something to be proud of, as it means you belong to a network of professional exchanges that keep each other accountable to doing the right thing. It should be a vital part of each barter company?s marketing efforts.? Don Mardak, President and CEO, reported that December was another ?fabulous month? for International Monetary Systems (OTCBB:INLM). ?Our revenue growth continues as our trade brokers generate higher trade velocity and new, incremental sales for their clients.? The company announced revenue for December was $619,000, an increase of 41% over December 2004, as they processed $6 million worth of trades for the second consecutive month. IMS reports its trade volume on barter purchases only (one side of the transaction), instead of the usual dual reporting of purchases plus sales. Continental Trade Exchange, under parent company IMS, serves more than 9,300 customers with 14,000 cardholders in 32 U.S. markets. Headquartered in New Berlin (WI), the firm generates revenue through monthly account maintenance fees of $12 cash and $12 trade, plus cash transaction fees of 12%, usually paid 6% by buyer and 6% by seller. For more information: www.internationalmonetary.com. The world?s largest barter company, Bartercard Plc., with 25,000 Australian businesses which are members of the barter organization, has affirmed that they process more transactions (in Australia) than American Express and Diners Club combined! In addition, Bartercard Australia has formed a strategic alliance with four major Australian banks?Commonwealth Bank of Australia, National Australia Bank, St. George, and Westpac Bank. The group agreed to Bartercard?s system of linking its barter platform with point-of-sales electronic funds transfer (EFTPOS or EPOS). According to CEO Wayne Sharpe, greater bottomline profits will result. He explained, ?The (previous) Bartercard New Zealand experience is such that approximately 70% of transactions are processed electronically, at a cost of up to 50% less than a (hand-processed) voucher transaction.? Sharpe said that Bartercard Australia accounts for over 65% of Bartercard?s revenue; its largest cash expense is head office administration printing, distribution, phone authorisations and processing of vouchers. Since members will now be able to buy products by making an EFTPOS transaction rather than filling out a voucher, Sharpe concluded, ?The net effect of this strategic alliance on our bottomline should be substantial.? The world?s largest trade exchange (www.bartercard.com) is working with internationally renowned SentryBay to deploy the first global online log-in protector across Bartercard?s 17-country franchise network. Customers who deploy the optional software (which takes one click from any international Bartercard web site) prevent any keylogging spyware from monitoring member log-in details. New Zealand-based SentryBay Corporation (www.sentrybay.com) has sales offices in North America and the United Kingdom. It has five current products, and licenses its patented anti-keylogging technology for use in protecting log-ins within third party software applications. Originating in Australia in 1991, Bartercard has expanded through franchising to 17 countries internationally. The firm is listed on the London Stock Exchange. Located in Salt Lake City, Matchbin.com was launched in 2002 as an online automated barter marketplace. The company has taken on a paradigm shift with the introduction of its ?Community Marketplace? that enables entrepreneurs, businesses, and organizations to own a web site that is locally focused, yet globally connected. The platform provides entry into the huge classified ad market. Matchbin sees their proprietary program providing significant opportunities for Community Marketplace partners to be on the cutting edge of e-commerce, and create significant growth for their organizations. Matchbin says it currently has 275 communities nationwide. The firm also offers other services, such as the Matchbin Storefront which is a retail site. A business of any size, can use it to barter or sell products and services to Internet users. There is a minimal flat fee of $39.95 per month. TeleTrade International (TTi) has updated its summary totals as reported in the January 17 Tuesday Report. CEO Gary Lasater explained, ?Processing totals since taking our technologies online in 1999 has exceeded $346,877,831, previous totals only reflected activity through 2004.? The primary web site accounting for this activity is www.eValues.net launched to help independent trade exchanges (barter companies) compete with larger national or international entities while maintaining their independence and control. ITEX Corporation (OTCBB:ITEX) has reduced it debt by more than $1.3 million during the last six months, in addition it has repurchased 250,000 shares of its common stock. CEO Steven White elaborated, ?We continue to execute an efficient, profitable model, growing both our business and revenues, as well as profits and cash flow. From our perspective, the best use of our cash at this time is the repayment of outstanding debt. We also took advantage of an opportunity to repurchase our common shares at an undervalued price.? Reiner Husemann, President of IRTA-Europe, and Bernard Lietaer, keynote speaker at last year?s IRTA Congress at Disney World, are on the advisory board for EBBS International Business School. EBBS is a business school for entrepreneurs that will use the advantages of barter and complementary currencies, such as time-dollars and trade dollars/euros. For more information go to www.ebbs.cc. Buddy Hooper, President of OrangeBee Private Monetary System in Florida (www.orangebee.com), asks the question, ?Is no one capable of signing up a new member in the barter industry?? Hooper?s query projects a prevalent reaction that occurs among exchange owners when a desirable member is chased by other barter companies. Fortunately for Hooper, in this case a loyal Florida magazine and client insisted (to the competing barter company) that all trades must go through OrangeBee. Obvious message: Clients appreciate great service and will reciprocate?in most situations?with a much appreciated loyalty. The BarterNews office received a call last week from an enterprising ITEX member located in San Diego. In one of the hottest real estate markets in the country, this client managed to acquire commercial space on full trade. And he is quickly subletting it out for cash. Putnam Investments Publishes Fascinating Look At ?Working Retired? The working retired represent 10% of the U.S. workforce age 40 or over; they are an educated and high-income group. The average household income of the 1,726 survey respondents was $87,000...60% higher than that of traditional non-working retirees. Plus the working retired are about twice as likely to have a college degree. Surprisingly, 60% still carry a mortgage...a large percentage for people in their sixties and seventies. Further, their home equity is relatively low, as on average these working retired own only 47% of their homes. They have investable assets of around $400,000, 70% wish they?d started saving more and sooner, and today they?re saving 11% of their total household income. There was no indication when the working retired plan to slow down their working, saving or spending. A closer look at the working retired population reveals a dichotomy: two-thirds of the survey?s respondents returned to the workforce because they ?wanted to,? but the remaining one-third went back out of economic necessity...they ?had to.? (Average household investable assets for these ?wanted to? workers are almost $550,000, compared to average investable assets of $140,000 for the ?had to? worker. For more information on the ?Working Retired? study visit the web site of the research-based consultancy focusing on retirement issues: www.brightworkpartners.com. According to the Oriental Morning Post out of Beijing, China has set up the Yangpu Oil Barter Exchange, reportedly the world?s first barter exchange for oil and gas. Located in the Yangpu Peninsula on Hainan Island in Southern China, it was set up in October after receiving approval from the goverment. Cheng Lianchang is the chairman of the exchange. Since its establishment in October the exchange has helped Chinese traders barter with traders from Russia and Thailand. To date, the contract value of the trades totals US$1.2 billion. The exchange enables traders to exchange crude oil for oil and gas products, as well as to invest in oil exploration companies. A memorandum for the construction of homes for the needy in exchange for land for gas stations has been signed in Moscow between the mayor of Sofia and the director of one of the world?s largest oil companies, Lukoil. New Creative Real Estate Investment Twist Takes Off! There?s a new way large commercial buildings are being bought and sold. The birthplace of the idea was Orange County, California...and it?s quickly become a multi-billion-dollar industry. The novelty is viewing real estate as securities, like stocks and bonds. Succinctly, multiple investors join together taking title to purchased buildings directly, through the age-old tenancy-in-common (TIC) form of ownership (rather than through a corporation or partnership]. Tenancy-in-common dates back to English common law under which an unmarried couple, for example, could buy a home and be able to share rights in the property. These days, many TIC investors are seeking to delay paying capital gains taxes when they sell. They can do so under the 1031 tax code, as long as they buy a similar property within in a certain period. These endeavors are for the long-term, inasmuch as there is no secondary market for tenant-in-common securities. Plus unanimous consent of all investors in a property may be required to sell it. Yet its growth is evidenced by the fact that in 2001 investors placed $165 million of their money into TIC transactions. Last year, 2005, it was $3 billion. Electronic Data Systems Corp. (EDS), the Dallas-based computer and data-services giant, plans to double within two years the number of workers it employs in countries that provide low-cost labor. CEO Michael Jordan says there is no way to reverse the outsourcing trend, as this is a much more competitive world than it was 10 years ago. Want to take a trip to outer space? Billionaire Richard Branson is offering frequent-flyer members of Virgin Atlantic the opportunity to do so on his Virgin Galactic Spaceport. Its first flight expected to take place in 2008. What?s needed for the trip? Two million frequent flyer miles earned from Virgin Atlantic flights. At 2? an air mile that?s a value of $40,000. But buying a ticket outright will cost you $200,000 on the initial flights, so trading in frequent flyer miles is a much better deal. Overseas interest in China?s vast domestic markets shows few signs of cooling. In 2005 foreign direct investment hit $60.33 billion, close to the previous year?s record figure of $60.63 billion. Figures are from China?s Ministry of Commerce. Send this page to a friend, simply fill in the e-mail addresses in boxes below.